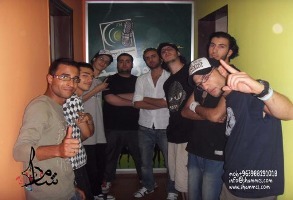 "Sham Mc's is a rap band from Syria arab world,bringing you arabic and english rap but with Eastern vibes something from their community,talking about their society and its problem,they Started in 2007 and now they have over 20000 fans all over the world,hope you like what they're doing and they're about to be worldwide btw"
We'll do album after album till we be 2pac of the east. Anything supernatural because we consider ourself A Miracle here in Syria 3000 copies in a place know nothing about hip hop. Sure he'll because Elvis is a legend and will always be.